In the beginning of May, my in-laws went to Disney World. They happened to be there during the May the 4th, also known as Star Wars Day. Disney, of course, had some wonderful shirts available for May the 4th. My in-laws asked if I’d like one and I told them to get me a size large. When they brought it back and I tried it on, though, it didn’t fit. A couple of weeks later, thanks to warmer weather, I took out my short sleeve shirts. I put one on but it was too snug. So I put another one on and another and another. All too tight. Clearly, it was time to lose some weight. Previously, I had success with writing down my food intake. It forces me to really examine what I’m eating and not just shove food into my mouth on a whim. However, writing food items down in a paper notebook is so pre-smartphone. 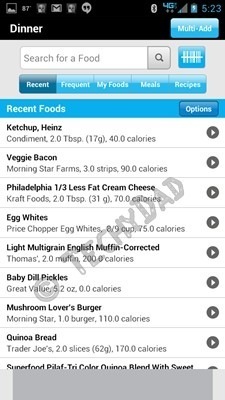 I did some searching in the Google Play store and found the MyFitnessPal Calorie Counter. After entering in my details (height, weight, etc. ), MyFitnessPal told me how many calories I had every day. Then, it was a simple matter of entering what I ate into my food diary. You can search for food. You can enter your own food. You can select food you’ve eaten before. 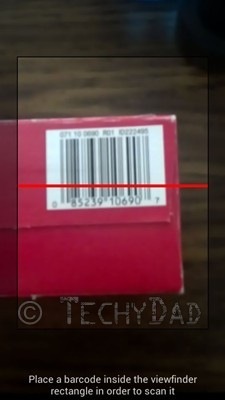 And, in my favorite feature of all, you can scan a barcode to find and enter food items. The database of food is very extensive. 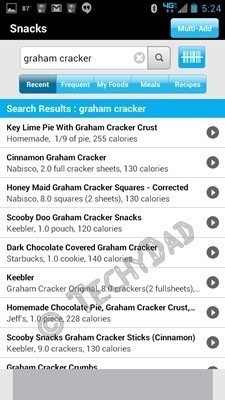 I had a new variety FiberOne snack cakes and the app found them quickly and easily. 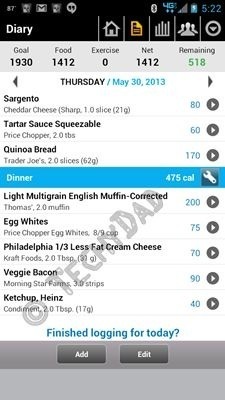 As you enter in food, the app tallies up how much you have consumed and displays how many calories you have left for the day. 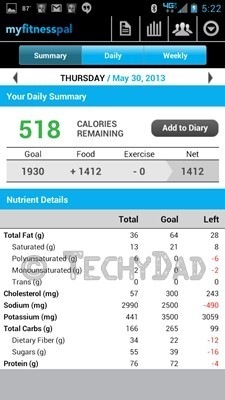 You can also see a detailed analysis of your nutritional intake. To get more calories to consume, you can exercise. Exercise is entered just like food only it adds to the calories you have available to you instead of subtracting them. 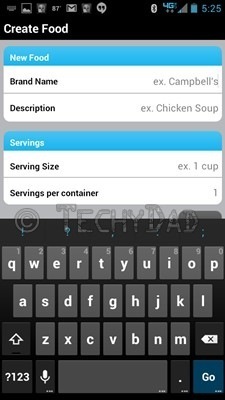 All of your data is synced to MyFitnessPal’s servers so you can enter information in multiple devices. 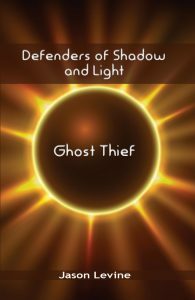 (There are iOS, Blackberry, and Windows Phone apps as well.) 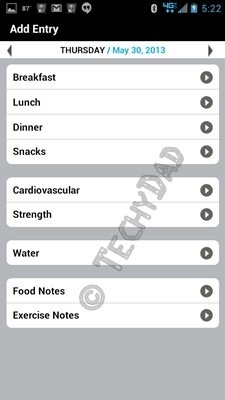 There’s a lot more to the app including weight charts, but as I’ve been using this for less than a week, I haven’t used these yet. Overall, I’m loving this app. It’s so much easier to keep track of what I’m eating than a notebook. I at first found the calorie count too low, but quickly found that my desire to eat bigger portions was more out of momentum than appetite. In fact, I’ve found that I typically end days with a few hundred calories to spare. Finally, while I can’t claim any "official" weight loss due to this being my first week of use, I checked on the scale and definitely seem to have lost two or three pounds. 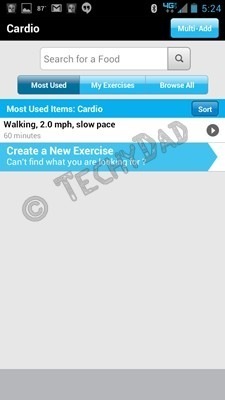 In any event, MyFitnessPal can be an invaluable aid in a weight loss plan.